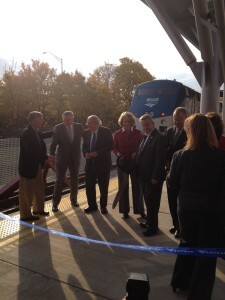 The Vernon J. Ehlers Amtrak Station Celebrates Grand Opening in Grand Rapids. Monday, October 27th marks the Amtrak Grand Rapids Vernon J. Ehlers station grand opening. The station, which serves the Pere Marquette service to Chicago, will integrate bus and rail transportation, offer more passenger amenities, and streamline train operations. U.S. Senator Carl Levin, Grand Rapids Mayor George Heartwell,and officials from MDOT, Amtrak, and The Rapid were all there to celebrate this morning. You can watch more coverage here and here.